This is a British surname, although of Greek origins. Introduced into England in particular after the famous Crusades of the 12th century, it is one of the patronymic forms of the male given name Steven or Stephen, deriving from the Greek word "stephanos" meaning "crown" or "wreath". In ancient Greece athletic champions were crowned with a wreath of laurels in recognition of their victories, and, no doubt, many victors would have named their sons Stephanos to commemorate their achievements. It was a popular name throughout Christendom in the Middle Ages, having been borne by the first Christian martyr. The name was particularly appropriate in this instance as martyrdom was regarded by Christians as a victory. "Stefanus", the Latinized form of the name, is recorded without surname in the English Domesday Book of 1086, whilst the surname first appears in the latter half of the 13th Century, when Robert Stephen of Cheshire appera in 1260, and Agnes Stiven of Berkshire in 1279. The patronymic forms Stevens and Stephens are recorded at that time also (see below). One of the earliest colonists to New England was Robert Stevens aged 22, who embarked from London on the ship "Planter" in 1634. 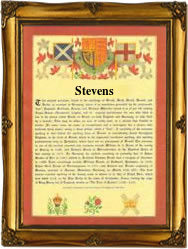 The first recorded spelling of the family name is shown to be that of Alice Stevenes. This was dated 1279, in the "Hundred Rolls of Huntingdonshire", during the reign of King Edward 1st of England, 1272 - 1307. Surnames became necessary when governments introduced personal taxation. In England this was sometimes known as Poll Tax. Throughout the centuries, surnames in every country have continued to "develop" often leading to astonishing variants of the original spelling.